Following on from the well received 3 Series Efficient Dynamics model, the logical extension to this eco-centric sub-brand is a 5 Series boasting similar fuel saving technology. The 520d ED has been designed to appeal to the hearts and wallets of company car drivers and fleet managers alike. Recent yeas have seen the 5 Series change radically in the looks department. This 'F10' model is less controversial than its predecessor but it's still a bold design. Despite the changes, it remains a popular choice – especially in the fiercely competitive company car market. BMW has steadily cultivated a reputation for producing increasingly efficient cars. In diesel guise some models boast fuel economy and CO2 levels that would shame a conventional small family hatchback. This performance has been accelerated by the introduction of the Efficient Dynamics sub-brand. Initially just a collection of technologies – engine stop-start, low friction tyres for example – the concept has been applied to whole vehicles. Building on the success of the 3 Series variant, this 5 Series model boast a full suite of features to help boast its performance to a level that would have been unheard of just a few years ago. Of course, BMW is also in a potentially tricky situation with its pursuit of low CO2 and fuel consumption. Buyers seeking 'the ultimate driving machine' might think that this is no longer the case, what with the bias having shifted away from outright performance. 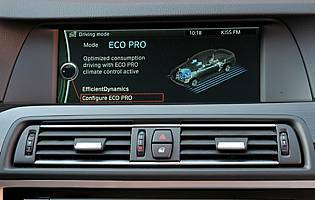 The German car maker routinely stresses this is not the case, and the 5 Series remains an agile machine in the right hands, and through the use of different electronic driving modes can be fine tuned to the driver's individual taste. There's no question that, in 520d ED guise, BMW has achieved what many only recently thought impossible. With its family hatch economy and CO2 figures, this big car is likely the first of many to turn the business car market on its head. The plush executive saloon proves you can have your cake and eat it. And you can do it, crucially, without any significant feeling of compromise. Boasting some very impressive fuel consumption and CO2 emissions figures, this particular 5 Series should prove cost effective to own for drivers seeking a large executive saloon. Residual values invariably prove strong for BMW products and the Efficient Dynamics variants should prove especially popular with company car drivers. The saloon model can never match the Touring's load carrying capacity but its deep boot is still practical enough for most demands. In the cabin there are numerous oddment storage spaces, although the centre console lacks a space for mobile phones unless you hid them in the covered armrest. With BMW's i-Drive technology having steadily improved over time, it's now become pleasingly intuitive, and controls an increasing number of the car's functions: ventilation, audio, satnav, telephone. 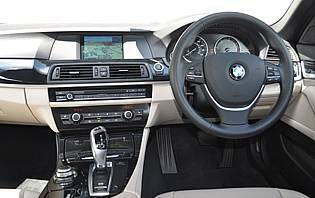 The car's main display and instruments are all up to BMW's usual high standard, but the auto gear lever requires a little practice to be fully comfortable with – the manual lever is better. The column stalks are short and stubby but have a quality feel. Ride comfort is good and the car's spacious interior aids the relaxing ambience inside the cabin and standard equipment levels mean adjustability of seating and environment for driver and passengers. Rear legroom would be even more generous of not for the thick front seat backs. Overall, though, the car's cabin is refined and quiet. Like its predecessor, this 5 Series benefits from an anti-theft and immobiliser package and is available with a keyless entry and start feature. Concealed, lockable storage in the cabin is adequate and the boot contents are secured thanks to the car's saloon body style. There's no shortage of safety kit in the 5 Series, with al the usual items -electronic stability control, airbags, ABS – all present. Isofix child seat anchors in the rear complete the package. Run flat tyres should ensure that you're never stranded, too. Despite the 'ultimate driving machine' sales pitch, it's obvious from the start that this 5 Series is biased towards economy. The car's default eco mode retunes the throttle pedal response, delivering a smooth but restrained acceleration sensation. Switching through normal and sports modes adds a welcome extra sparkle to proceedings. Elsewhere the car is well damped and responsive, and the diesel engine is a willing and refined unit. Although the estate Touring will have the upper hand here, the saloon's cabin is big enough to accommodate a growing family. Bulky items – cycles, sports kit – might have to go in a roof box or carrier, and is the only time that you'll wish you bought a Touring. For less demanding roles the saloon will be a fine choice. 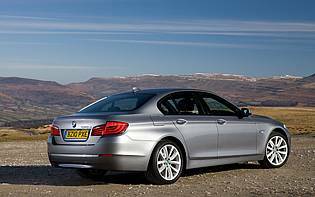 A large and relatively expensive model even in economy trim, the 5 Series is unlikely to pop up on the first car radar. Even drivers opting for their first company car are more likely to find a smaller 1 Series or 3 Series more suitable and affordable. This F10 model displays and more restrained appearance than its predecessor, and one that's likely to generate wider interest from conservative buyers. Furthermore, BMW's Efficient Dynamics sub-brand has done wonders for boosting sales of frugal models and the German manufacturer's image as a builder of stylish, reliable, nimble, and solid vehicle is second-to-none. Predictably this car is model is bigger in all the key areas over its predecessor, and offers occupants plenty of room. Access through the car's front doors is good and the rear door aperture is generous for something in this class. Accessing the large boot is easy, although the spring nature of the boot's hinges means a hefty shove is required to close it. With this model an obvious choice for company car drivers, BMW is well aware of the importance of communications kit in a car such as this and has included Bluetooth mobile phone integration as standard. Buyers can also upgrade to a system which will even read out emails on the move. The optional satellite navigation works well on the standard seven-inch screen and digital radio and MP3 music player connectivity can also be specified. Sound quality from the standard kit is good. Lighter hues work best and show off the exterior details in a way darker shades do not. Inside, the SE trim level brings plush carpeting and stylish high gloss trim panels contrasting with aluminium detailing. Cabin ambience is appropriately somber due to the dark headlining. Given the size of this generation of 5 Series Park Distance Control is thankfully standard, which makes manoeuvring considerably easier aided by the large on-screen guide and the audible warning. The rear-drive layout means the turning circle is good, but drivers not used to such large vehicles may find suitable parallel parking opportunities hard to come by at first. Petrol engine options – 520i (184bhp); 528i (245bhp); 530i (272bhp); 535i (306bhp); 550i (407bhp). 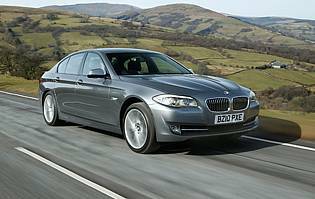 Diesel engine options – 520d, 520d Efficient Dynamics (184bhp); 525d (218bhp); 3.0-litre (258bhp); 535d (313bhp). Transmission options: six-speed manual gearbox, eight-speed automatic gearbox depending on model. Trim levels: SE, M Sport.